April started off with much chores to be done, when you have a big day ahead of you, a big country breakfast is a must! 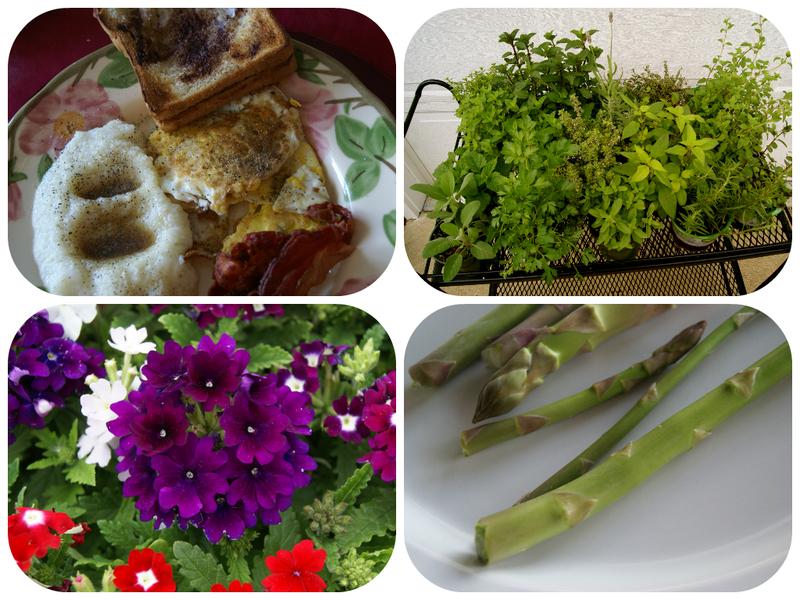 I love herbs and have grown them for years, replenishing the herb garden was on our to do list this year, and of course beautiful colorful flowers were on the list too! Our asparagus began producing, and is still enjoyed. 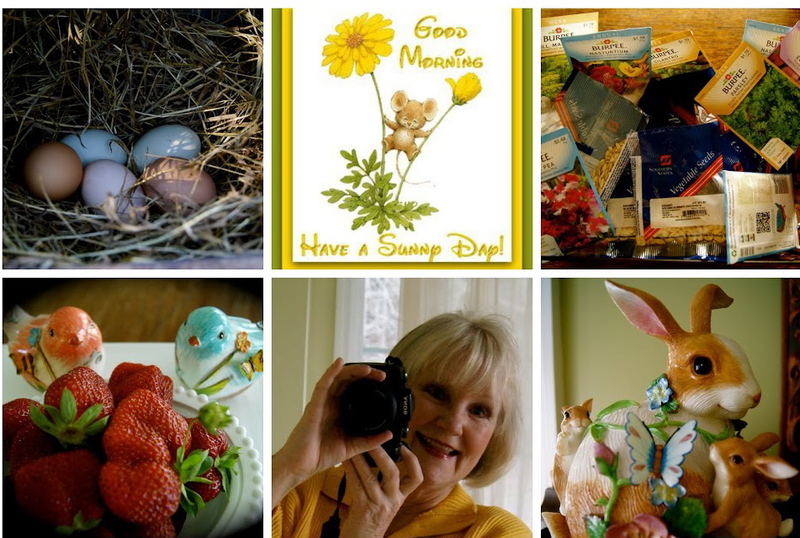 In the second week of April, I began to think of spring decorating, so out came the rabbits, I took early morning walks, saw spring coming forth with new life! The eggs were laid by a sand fiddler in the walkway, so much for sand. The dandelion in both stages, flower and seed, Do you like to pick dandelions and blow the seed away, I do! I found the blueberry bushes full of bees! 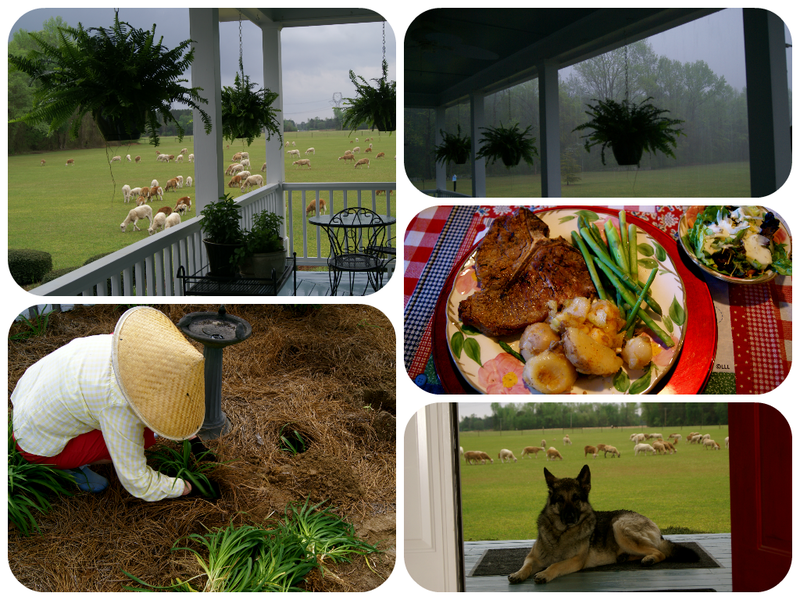 Moving right along..Sometimes Mr P. will let the sheep graze the front lawn, I love to watch them, we have had an abundance of rain this April, my ferns are thriving on the porch, and of course after a long day of digging, we eat another hardy meal, our dear Lucy makes the best Shepherdess, she is so gentle, but firm in herding them. 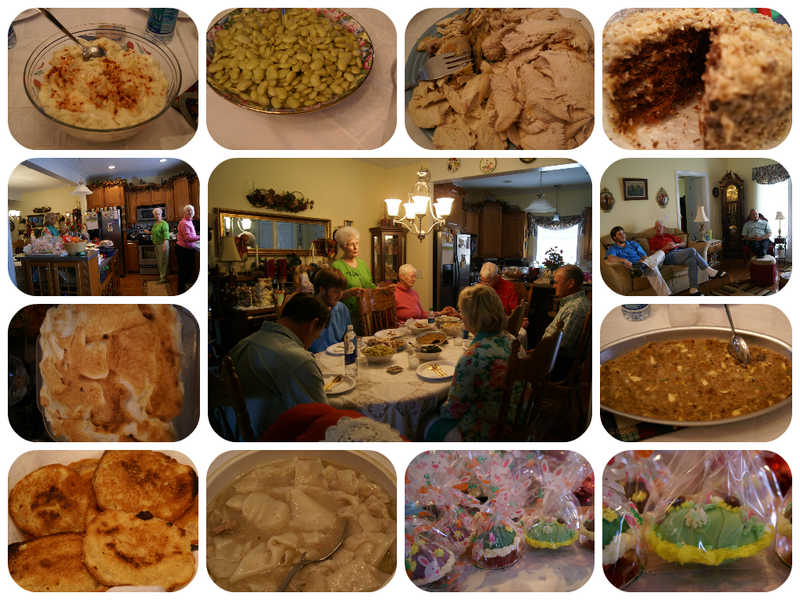 The previous photos led up to a week ending in celebration of a most Holy Day, that is Resurrection Sunday, which was a time of remembrance of this most Blessed Day, family fellowship and lunch at My Mom's. Do you ever go outside the norm, we did My mother usually sets her table with her fine china, and silver, this Easter we all voted to go casual, to finish cleanup in a hurry, to be able to spend longer fellowship time together, as some had to leave early to go back home. Being the matriarch she usually prays blessings for the food and for her family! Her menu was turkey with dressing,butter beans, potato salad , collards, fruit salad ,chicken and dumplings, cornbread, dessert was chocolate meringue pie, Mound cake, and my favorite hot banana pudding, needless to say we all went home with full tummies, fond memories and lots of leftovers, plus a decorated peanut butter chocolate egg! Yummy!!!! Now Dear Friends, I will close this most beautiful and anticipated month with the first roses of the year, which were gathered this morning from the rose garden just for you, and especially for our hostess, Cheryl ! I wanted to post today but told Cheryl that I might not be able too, but would try,I have committed myself to two memes a month, Gathering the Moments, and Vee's Notecard party, one of the things you might not know about me is, I am very loyal, and when I commit I try if at all possible to fulfill my commitment! Blame that on my upbringing. ~smile~ Plus I just adore these two ladies and their parties. My reasons for thinking about not posting were, number one being, I am so busy, and I actually didn't think I had taken enough photos in April, but after going through IPhoto , I found I had more than what I thought and did not want to miss the opportunity of being able to look back! Thank you Cheryl for hosting "Gathering the Moments", and for being so gracious! This one looks like a moth, anyway he like to throw kisses, too! One of the first signs of spring at the farm is when I see the butterflies! They are so graceful, fluttering back and forth from flower to flower! Sometimes I will find at least twenty or more on one plant, I run to get my camera, but they must know what I plan to do, so much so, that they play cat and mouse with me! Even at my age I love to chase them, a very funny sight to see. I am joining Vee, and many others for April's Note Card Party, always so much fun! Thank you Vee for being such a gracious hostess. Saturday was such a beautiful day, (80's) we took advantage of it, by visiting our favorite greenhouse nursery. Our intentions were to buy wave petunias and make our own hanging baskets, like we do every year, that soon changed when dh, and my friend, the owner, talked me into buying sun ferns, I am a flower girl and love color, dh loves flowers too, but reminded me of having to water them twice a day in summer. A point well taken. The owner's point was, when summer comes, the ferns will make the porch seem cool! Homeward bound, Jack wasn't to happy about being pushed out of his seat. ~smile~ but always the southern gentleman dog he is. On the way home I am thinking, "I want color, I wonder if I am going to be happy with these ferns, for hanging baskets, why did I let them talk me into buying them, was I sleep walking? ~smile~If I had come by myself, I know what flowers would be in the back, hmmmm! Labels: gardening, trip to garden center. 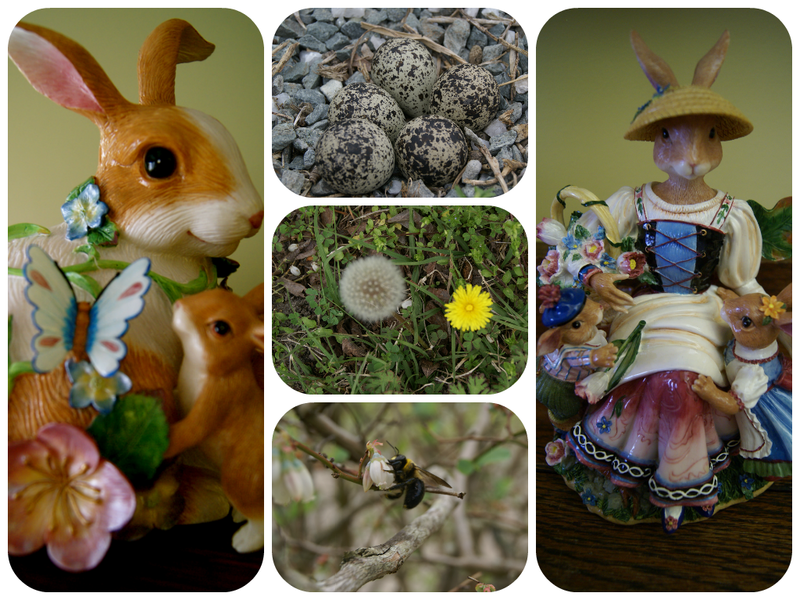 March went by so fast for me, and I am glad it seemed to pass so quickly, now I know spring has finally arrived. I was so busy with the garden that I didn't take the time to take many photos, we did a lot of preparing of the gardens for planting, but the highlight of March was a visit from our son, his son and his fiancee'. That's where I have been this past week, enjoying and savoring moments with them. The father and son don't live near each other nor near us so it was a special treat for all. I loved seeing the pair of them enjoy this special time together. There is always something unusual to see around the farm, this Navy Blimp just meandered by the other day. While here our son was shopping for a special take home gift for his wife,(she wasn't able to come because of her job) I went along to help as much as I could, when he had chosen the necklace I went outside the jewelers to wait while he checked out, he called me back to the counter and showed me this ring. He- "Mother how do you like this ring? Me- "Very pretty, it looks antique ." He- Would you wear it?" Me- Thinking he was getting this as an added gift for his wife I said "Yes I would." He- "it's yours, try it on." It fit perfectly, This was such a nice surprise, I wore it all afternoon admiring it many times, and making sure it was seen by others. ~smile~ This token of his love will be a memory that I will always treasure. Family left yesterday and are now safely home, I am adjusting today as the house is once again quiet, and have been trying to catch up on blogging. Tomorrow I will be planting herbs in the garden, and still savoring moments. I am joining Cheryl's "A Gathering of Moments", though a little late. Thank you for hosting Cheryl.